Simple farmhouse "this property", 2 storeys, terraced. 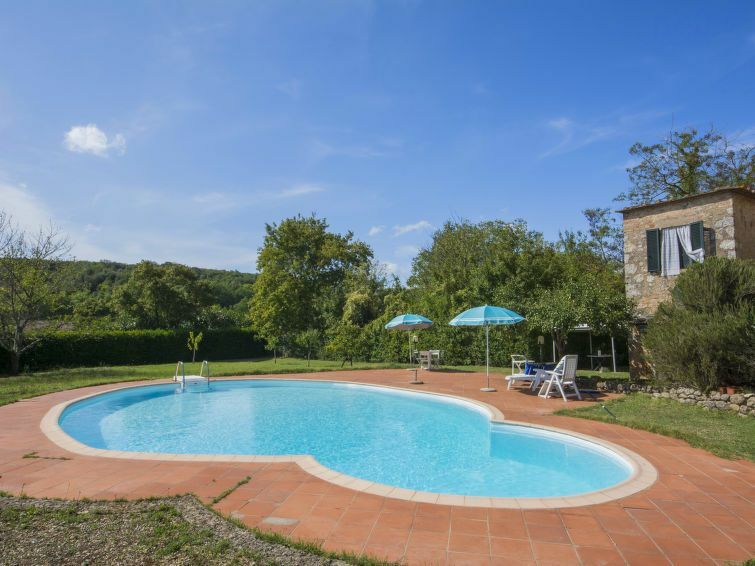 5 km from the centre of Sovicille, 14 km from the centre of Siena, in a quiet position. Private: garden (fenced) with lawn and trees, swimming pool round (6 x 12 m, depth 120 - 280 cm, 08.06.-30.09.). Patio, garden furniture, barbecue, parking on the premises. Supermarket 5 km, restaurant 3 km, railway station "Siena" 15 km. Nearby attractions: San Gimignano, Pienza, Florence 80 km. "this property", 3-room house 45 m2 on 2 levels, on the ground floor. Very simple and rustic furnishings: small kitchen (2 hot plates) with dining table. Upper floor: small living room. 1 double bedroom. 1 room with 1 x 2 bunk beds. Shower/bidet/WC. The bathroom has a room height between 1.5 and 2.1 m.